Stormtrooper mimicking a photographer at the entrance to Disney’s Hollywood Studios during Star Wars Weekend. Nikon D700/28-300VR, 1/400s, f/10, ISO 200, EV +0.3, 250mm focal length. Imperial Stormtroopers greeted guests above the entrance to Disney’s Hollywood Studios during Star Wars Weekend. This stormtrooper was mimicking me taking photos of him. 🙂 Get ready for a few Disney posts! I am still recovering from the Disney vacation which wore out my Nikon D700 camera as the shutter locked up a couple of hours before returning home. Will be sending it in to Nikon for repairs. I will dust off the old D70 during its absence. I will be publishing the Blue Hour assignment recap next week. 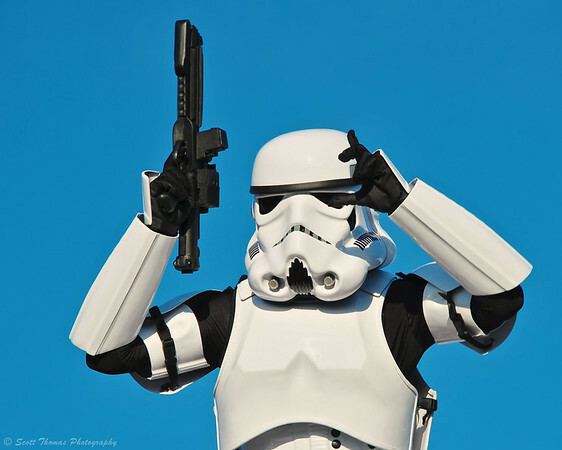 This entry was posted in Travel and tagged 28-300mm, blue, disney's hollywood studios, florida, imperial stormtrooper, nikon D700, orlando, sky, star wars weekend, vacation, vr, walt disney world. Bookmark the permalink. hahaha what a great shot 😀 I love it! Yeah, reality is not so much fun. 😀 The stormtroopers were a riot here at the entrance and throughout the park. Might have to make a post just about them. Cute pic! I’ll have to show it to my younger daughter who has recently become, in her words, a “Star Wars nerd”! She would LOVE going to a Star Wars Weekend. The cover all the movies and the animated series. Look for a post or two about it next week. That is so cool Scott! His firearm looks just like the Lego version. It probably is! I got a close up look of one later in the day. I’ll look for logos.